Dr.Wm D'Leoni’s new book, Big Bang Theology - God's Purpose for Creation, ($10.99, paperback, 9781498457453; $5.99, e-book, 9781498457460) postulates that the purpose of life is love. The author explains that the “Big Bang” began God’s quest for love, seeking for a people who would be his people to love and who would love him. 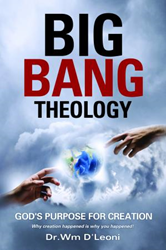 He believes that Big Bang theology can help readers find God’s love and God’s will. His hope is that rebooting one’s faith to the Big Bang beginning may be the restart perspective each person needs in order to see past the traditional, institutional, religious, and cultural fog to meet God and find heaven. Many thought-provoking topics in this outstanding book will help readers find their purpose for this life and the life after in eternity. Dr.Wm D'Leoni is an outside-the-box thinker who wrote this book for outside-the-church-box believers and non-believers – but not outside-the-Bible-box. Xulon Press, a division of Salem Media Group, is the world’s largest Christian self-publisher, with more than 15,000 titles published to date. Retailers may order Big Bang Theology - God's Purpose for Creation through Ingram Book Company and/or Spring Arbor Book Distributors. The book is available online through xulonpress.com/bookstore, amazon.com, and barnesandnoble.com.